Population: 516,733 (2010 est): At least 700,000 Cape Verdeans live outside the country (especially in the US and Portugal). People and languages: Cape Verdeans are a Luso-African mixture. Portuguese and Crioulo (a mixture of Portuguese and West African vocabulary), are both official languages. Religion: Christianity (mainly Roman Catholicism). 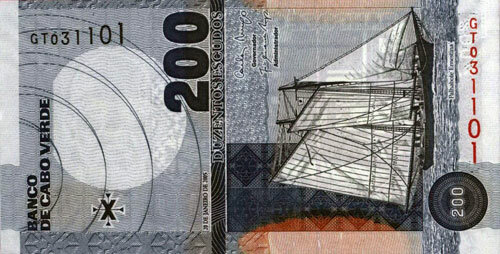 Currency: Cape Verdean Escudo (CVE), pegged to the Euro. Major political parties: African Party for Independence of Cape Verde (PAICV, the governing party); Movement for Democracy (MPD) Democratic Alliance for Change (ADM, a coalition of PCD, PTS, and UCID); Democratic Renovation Party (PRD); Party for Democratic Convergence (PCD). Membership of international groups/organisations: African Union (AU), Economic Community of West African States (ECOWAS) and the African Development Bank (AfDB), CPLP (Organisation of Portuguese Speaking Countries), African Countries with Portuguese as the Official Language (PALOP). Main economic sectors: agricultural production, including bananas, sweet potatoes, sugarcane, coffee, peanuts and fish. Secondary industries include fuel and textiles and the services sector includes tourism, shipping and transport. Major Trading Partners: Portugal is by far the largest trading partner. Other trading partners include other EU countries and the US. Despite its poverty of resources, Cape Verde has enjoyed steady if low level development, mainly centred on services (including a developing shipping sector) and tourism. 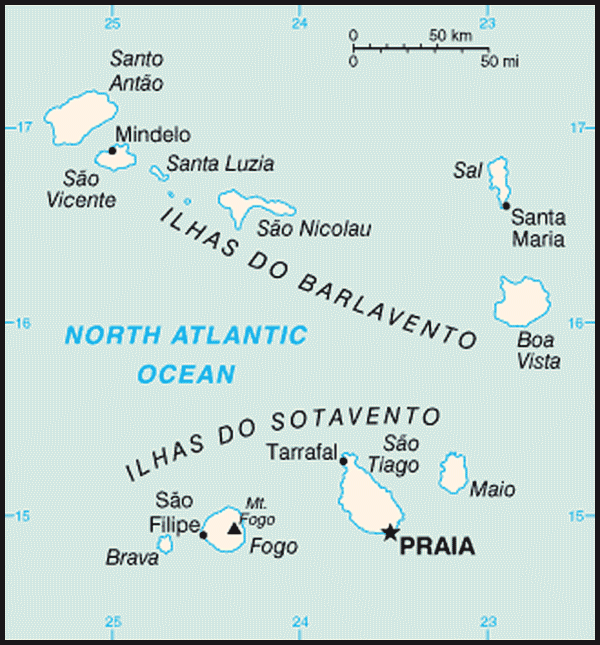 More Cape Verdeans live outside the islands than in the country. The country therefore benefits from remittances from expatriate workers, which total an estimated 10% of the national economy. The majority of the active population is engaged in agriculture, but Cape Verde is arid and prone to droughts. As a result it suffers periodic food shortages, and has to receive food aid. Cape Verde has an efficient and generally uncorrupt bureaucracy. The economy has been generally well managed. Relations with aid donors are good. The main aid donors are the EU and the World Bank. Aid funds are concentrated on poverty alleviation, and infrastructure, especially water provision. The government is currently pursuing a privatisation programme. 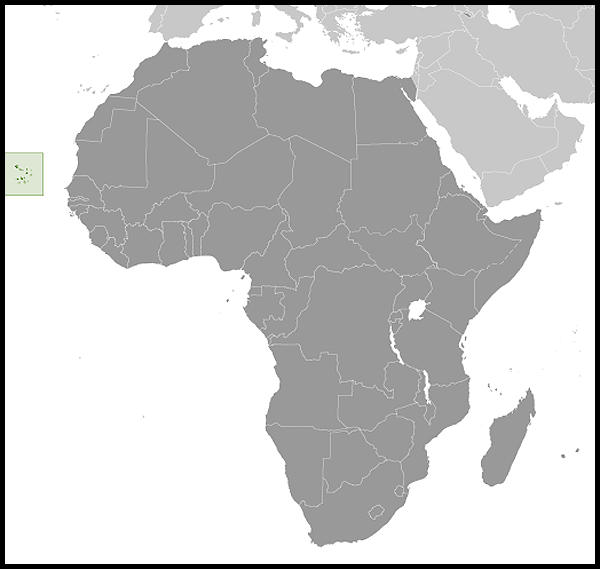 Cape Verde was colonised by the Portuguese in the 15th century. The Portuguese used Cape Verdeans as administrators throughout their African empire, and as labour on their shipping lines. During the 19th century Cape Verdeans used to crew American whalers in the Atlantic. Since this time, Cape Verdeans have had a strong tradition of emigrating to find work. Major droughts and famines have historically also propelled mass migrations from the islands. The country became independent in 1975, following the collapse of the Portuguese empire after the Carnation Revolution in Lisbon of 1974. The aspiration of the leader of the independence struggle, Amilcar Cabral, for an eventual political union between Cape Verde and Guinea Bissau was never to come to fruition however, and was abandoned in 1981 following the overthrow in Guinea Bissau of President Luis Cabral, also a Cape Verdean. Until 1981, the country was ruled by Aristide Pereira and by the party which bought independence, the PAIGC (Partido Africano da Independencia da Guine e Cabo Verde), which became the PAICV (the African Party for the Independence of Cape Verde) in 1981. Pereira’s rule was stable and benevolent, but did not allow for political pluralism. In 1990, under domestic and international pressure, he opened up the political system to multipartyism. Due to the history of the country and the large diaspora, Cape Verde has a wide ranging international outlook. The country benefits from close relations with Portugal, and is actively seeking closer relations with the EU as a whole. Its currency, the Escudo, is pegged to the Euro. On 20 November 2007 the European Union agreed to a Special Partnership arrangement with Cape Verde consisting of co-operation on governance, regional integration and information technology. The country also looks to the African continent, a relationship underpinned by the historic role of the PAIGC as a guerrilla movement fighting on African soil for the liberation of the archipelago. This was cemented in 1977 when Cape Verde joined the sub-regional organisation ECOWAS. Cape Verde is also a founding member of the Lusophone organisation the CPLP and seeks closer economic links with Brazil as a transit hub for trade with the EU. Relations are friendly but not substantial. A British Group of the Inter-Parliamentary Union visited Cape Verde in September 2001, followed by a visit to the UK by Cape Verde’s National Assembly Speaker, Mr Aristides Lima, in November 2002. More recently a parliamentary delegation from Cape Verde visited the UK in May 2003. A small but increasing number of British nationals are acquiring holiday or retirement homes on the archipelago. The British Embassy in Dakar, Senegal, is responsible for the UK’s relations with Cape Verde. The UK has an Honorary Consul, Mr Antonio Canuto, based in Mindelo, Sao Vicente. There are historic UK links with Mindelo which British ships used for bunkering until the 1950s. There is a very small Cape Verdean community in the UK, mainly the families of former seamen. Cape Verde consists of 10 main islands situated about 600km off the Senegalese coast (West Africa). The climate is hot and dry; the islands suffer periodically from drought. The volume of trade between the United Kingdom and Cape Verde is small. British exports to Cape Verde in 2010 were worth approximately £5 million, up from £4 million the in 2005. British commercial interests in Cape Verde are handled by the British Embassy in Dakar, Senegal. A new constitution was adopted in 1992 to formalise the new dispensation. It was subsequently amended in 1999. It provides for an elected President who is required to get two-thirds of the vote in the first round to win, or the majority of votes in a second-round runoff between the 2 top candidates. There is a 72-member National Assembly. Its members choose the Prime Minister to whom he is accountable. The President has the right to dissolve the National Assembly. 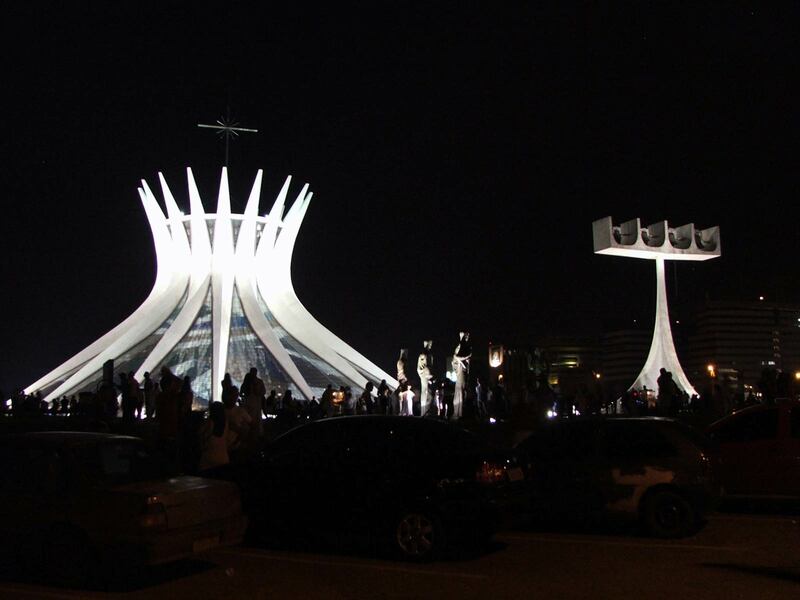 In the first multi-party legislative elections held in January 1991, the opposition MPD (Movement for Democracy) won 56 of the 72 seats and their candidate Antonio Mascarenhas Monteiro comfortably defeated Pereira in the presidential elections held one month later. In December 1995, the MPD won its second landslide victory in the legislative elections. The incumbent President, Antonio Mascarenhas Monteiro was re-elected unopposed in February 1996. Following a divisive leadership battle in the MPD, the PAICV (the African Party for the Independence of Cape Verde) made a comeback in the January 2001 legislative elections, winning 40 seats. The MPD nevertheless won 30 seats, confirming Cape Verde’s 2-party politics. In the Presidential elections of February the same year, Pedro Pires of the PAICV and Carlos Viega of the MPD came first and second. Pires won the second round, but only after the National Electoral Commission confirmed his victory by just 17 votes. In legislative elections held on 22 January 2006, the ruling PAICV was re-elected with more than half the votes cast. Presidentials on 12 February 2006 resulted in the re-election of Pedro Pires on first round voting. In February 2011, Cape Verde held a successful round of parliamentary elections. The Independent National Electoral Commission (NEC) judged the elections to have been free and fair. Three parties now hold seats in the National Assembly: PAICV 39, MPD 31, and the Cape Verdean Independent and Democratic Union (UCID) 2. A first round of Presidential elections was held on August 7, 2011. The top two contenders, Jorge Carlos Fonseca, of MPD, and Manuel Inocêncio Sousa, of PAICV, received 37.4% and 32.8% of the vote, respectively. A run-off on August 21, 2011 was won by Jorge Carlos Fonseca, who secured nearly 55% of the vote.